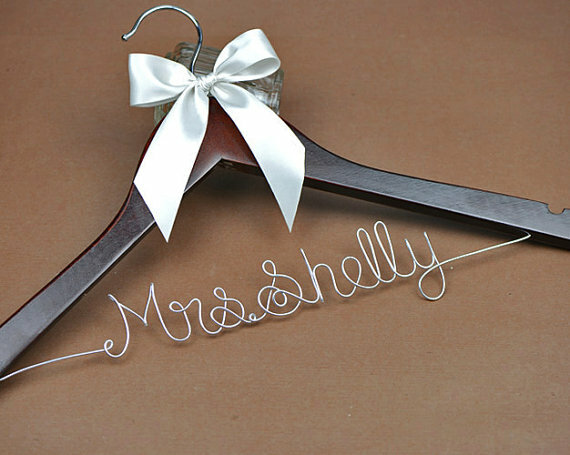 What's a personalized wire name wedding hanger? 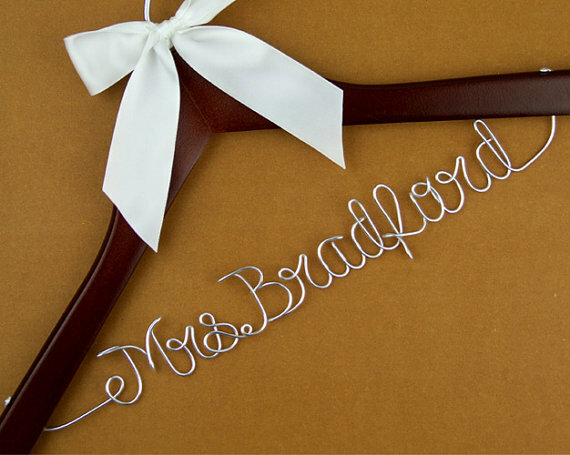 A personalized wire name wedding hanger is a wood hanger assembled with a bride name, bridesmaid name or a phrase made of aluminum wire. 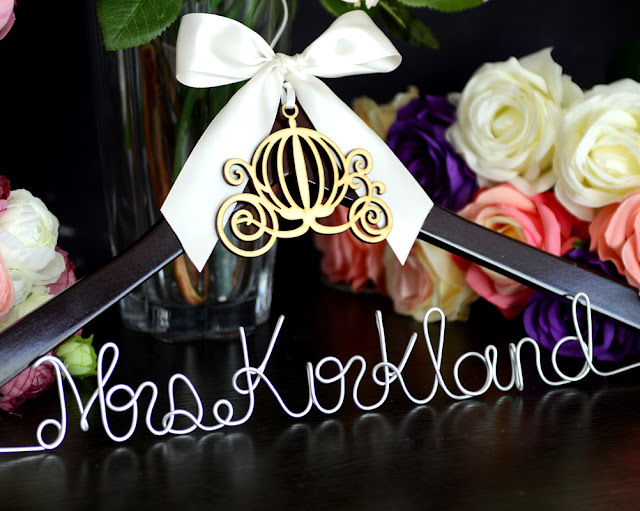 With the bride's newly taken last name hanging above her wedding dress before she slip it on, this bridal hanger is really meaningful for wedding dress photography. Finding a proper hanger to hang the wedding dress has become a necessary part for a perfect wedding planning. 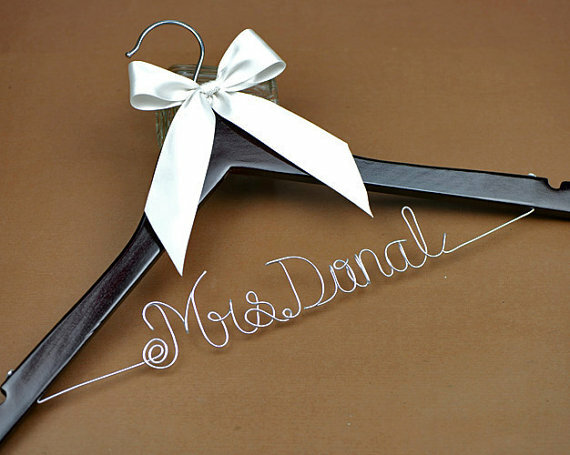 That's why a personalized wedding dress hanger has become a hot gift idea for brides and bridesmaids. 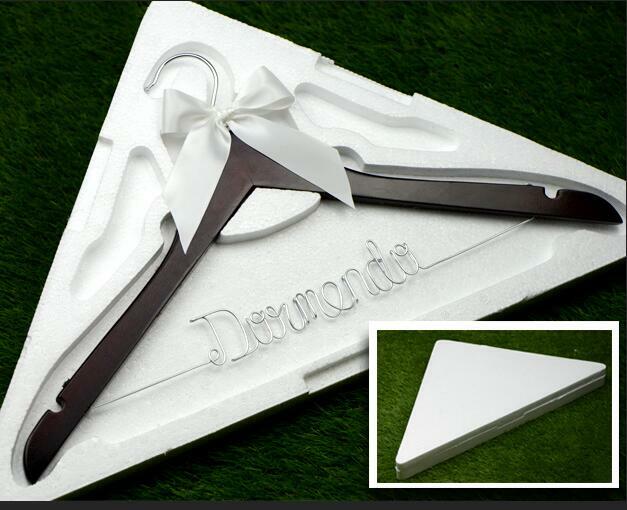 We have seen a lot of brides-to-be shed tears when they were gifted such a custom hanger at their wedding showers. How to make a wire name hanger? The wire name is purely handmade and then assembled on a wood hanger. Bending the wire into a name is the most difficult and key part. You need to find the proper style of wire. Everybody could do it as long as you have time and patience to source the wire and hanger and to practice bending skills. Making a wedding hanger by yourself is really fun, but If you could get a better one in 10-15 days at just 12-15 bucks including shipping, why bother spending over $10 for materials and over a week to make the letters look like letters? You need a professional vendor like Bridenew who supplies great wire name hangers at affordable prices. With us, there are no worries about skills, materials, packaging and stunning designs. Unlike most of the vendors who make products at home, Bridenew has grown up from a home maker to a professional team with capacity of producing over 200 custom hangers within one single day. In our team, benders do bending, assemblers do assembling and packagers do packaging. Every member is professional and that makes our goals happen: high efficiency, great quality and quick shipping. We have developed 4 more different fonts to meet the interests of customers. We don't only make hangers with just names. 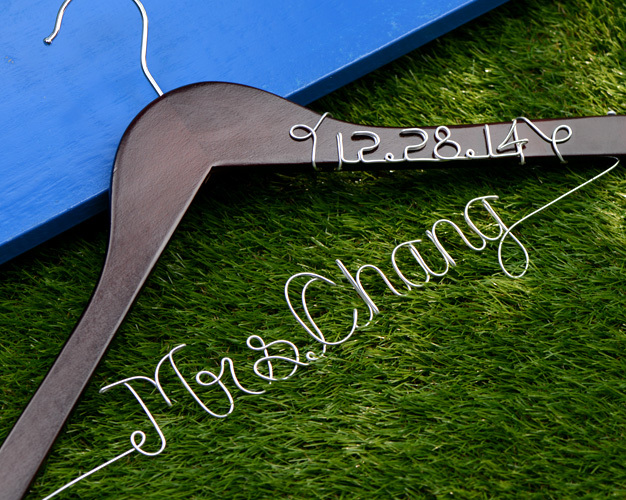 We also do wedding dress hangers with dates and charms. Every Bridenew wedding hanger has a notch at each end so you don't need to worry that the straps will slide off. Each hanger is strong enough to hold up to 10kgs so even if your wedding gown is super long and heavy, feel safe so hang it on. You don't want to ruin your wedding shower gift on the way, so protecting the dedicated wire name is a big issue. 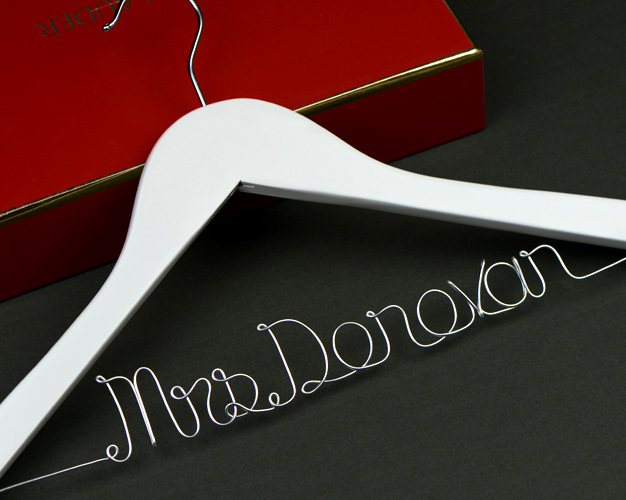 We designed a protective poly foam case specially for wire name hangers. It will protect your hangers perfectly in the long way delivery. It's also a great storage for the meaningful hanger after the wedding celebration for keepsake. 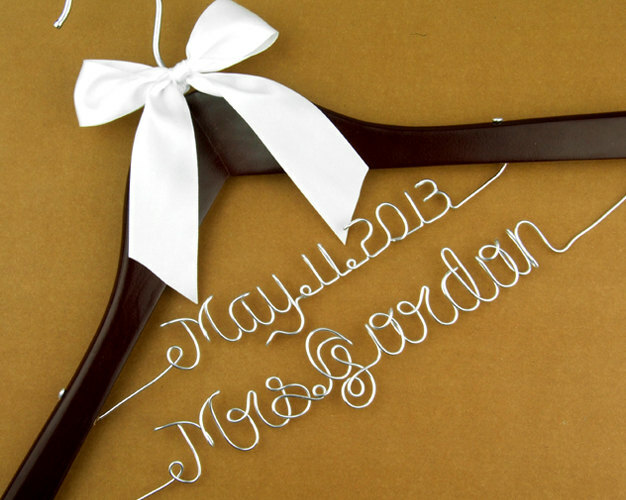 Bridenew has the capacity to ship each order for personalized bridal hangers out within 24 hours after payment. So even though we ship from China and each hanger is one of a kind, we could deliver it 10-15 days after ordering date. About postage, don't be cheated by Etsy sellers. They charge you over $10 for local shipping and tell you the parcel is big. This is ridiculous. Each hanger weights about 150g so it will never cost so much even for USPS first class. When a seller like us from China could ship it at $4 and guarantee delivery in 15 days, how could local US sellers charge you $10 and offer an even longer turnaround?